Are you tired of the same old online casino, where even if you use bitcoin you are still exposed to the site owners? Do you want to get back your full anonymity while gambling and don’t want to wait for transactions to cash out your winnings? Well, you just might have stroke gold. A fantastic team of developers thought everything that players on such online casinos don’t like and came up with the idea to create a network. A network that is different than the others. A network that understands the idiom “life is short and time is swift” thus putting a stop to all the tiring and time-consuming procedures. The name of this online Poker platform is none other than Virtue Poker. Virtue Poker is the first Ethreum-based poker casino, that will use Ethereum exclusively, instead of Bitcoin. There are many benefits of using Ethereum in online gambling, especially increased security measures and faster transactions. The platform has not been launched yet; the core team is currently preparing for a token sale as a crowdfunding exercise. The date should be announced after the ICO token sale finishes. The developer team started working on the project back in 2015, and the platform has already 13,000 lines of code running on it, and the number is growing by the day. Virtue Poker is planned to be fully functional and thus get published by the end of 2018. Little are known as to the variety of games, but when it comes to how the system is going to work we already know everything, and we couldn’t be happier with what is going on. Unlike other casinos, Virtue Poker will require its members to download two programs. One will be the client where you can join the Poker games, and the other will be a mobile application called uPort. Using the latter, users will have to make and validate a virtual identity linked with uPort that will be used every time they log in to the platform. The creator wanted to raise the quality of the platform beyond the normal levels when it comes both to the play style and safety. So what did they do to achieve such thing? They implemented a system never seen before. Instead of having an account linked to the website in which you can deposit your money as other online casinos do, Virtue Poker lets the players use their cryptocurrency wallet, where their cryptocoins are already stored, to play. At first, when we heard about that we were cautious as to how would the rounds be legit. Imagine you are winning and your opponent sees that so it shuts the client down and logs off. The funds would still be safe in a cryptocurrency wallet. Well, the Virtue Poker team thought about this too. So to confront that problem, they decided to implement a safety system. Specific amounts of money are held in escrow when the player buys in a table, plays a hand and when a person exits the table. That way if someone were to exit in order not to lose money, the system would catch that person red-handed and hold the money. A player could even get temporarily banned, but further information isn’t still known. The word “virtue” suits the platform’s identity entirely as it means power, superiority, and strength – three things a player will have total control of while playing. Even the dealing system will be held by each player’s client. Taking turns in the dealing of the cards will be done by each player while safety measures have been made to ensure there will be no tampering with the system. Therefore the possibility of cheating is zero. And of course, what’s more, the famous random number generation system is implemented so there is no case of match-fixing. When mentioning cryptocurrency wallets and blockchain, it can only mean one thing – cryptocurrency. If you were expecting Bitcoin, though, you were wrong. There will be no bitcoin usage whatsoever. The “king” of the cryptocurrencies for this site will be the second most popular, Ethereum. On top of that, there will also be a Virtue Poker Point (VPP) token. Ethereum will be used on the entirety of the platform’s games including short-term “contracts” used in each table, regular or tournament when it comes to buying in’s and stakes as well as bets of all kinds. Like the things we previously mentioned weren’t enough to ensure the system’s safety, Virtue Poker will also have a particular database where every single hand that is played will be stored. That way the system will have the ability to do scans to avoid cheating continuously, bot and collusion detection, account sharing and prevent the creation of multiple accounts. Based on how many VPP tokens a user has, a player can join the “Justice” system. It is another safety measure, taken from the developers, which assigns power and responsibility to the platform’s users. Players who have bought VPP tokens will have some special treatment when it comes to the buy-in stakes and some other things but if they get caught cheating or misreporting any results then they will be banned from the justice pool and these stakes will be seised. Yes, the developers have already stated that all the usual bonuses and promotions will also exist on the Virtue Poker platform, including affiliate programs as well as referral credits. The details will be released after the official launch of the platform. Even though all of that sounds great, the team wanted to have an extra ace in the hole, so they contacted some pretty famous players from the Poker industry. These are Brian Rast, the 10th all-time money list with 3 WSOP bracelets and the Poker sensation Dan Colman, the 3rd all-time money list with 1 WSOP bracelet. Both are already working on the project as advisors and have been interviewed publicly. They both confirmed the excitement of working for a new kind of platform like Virtue Poker, and can’t wait till the platform get released by the end of 2018. On top of all these the developers plan to acquire all necessary licenses and certificates so they can be sure to launch when they are entirely legal to start getting players to use their platform and also begin their VPP sale system. If you are a Poker player just like us, then you are in for a treat. Let’s hope all goes according to plan and we will be able to join the platform by the end of 2018. Thank you, Virtue Poker’s team for listening to the players’ feedback and finally implementing a whole new system. If you want to participate in Virtue Poker crowdfunding, make sure to sign up for an email newsletter on their website to be notified of the launch date. 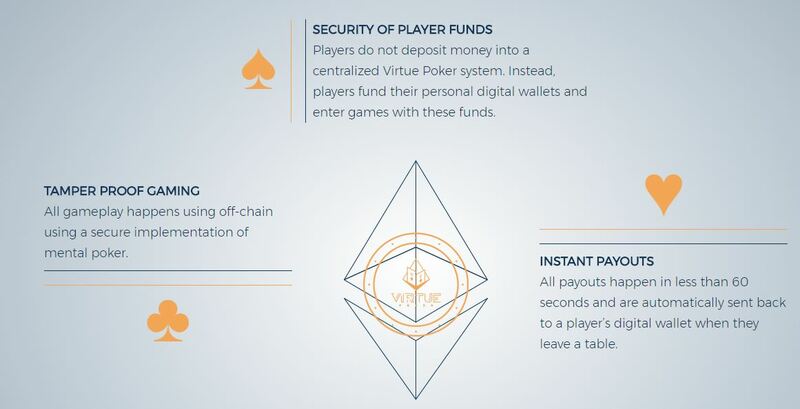 Investing in Virtue Poker – the first Ethereum-based poker casino – can turn into a satisfactory way of making a profit and the tokens can become worth a significant amount of money in the future, not just through cryptocurrency gambling but also through a digital currency itself.